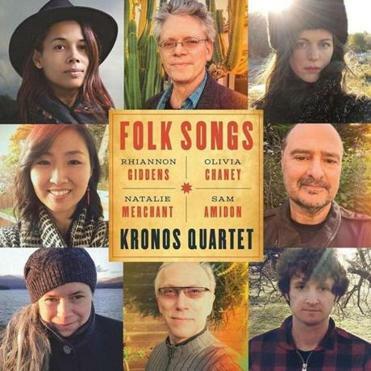 Kronos Quartet collaborates with modern-day troubadours Sam Amidon, Olivia Chaney, Natalie Merchant, and Rhiannon Giddens for this album, which covers a satisfying range of folk traditions. Whether adding sinewy string accents to Amidon’s takes on old American songs or acting as the sonic sea on which Giddens’s mournful voice floats, there’s not a bad take in the bunch. Three virtuosi with ample past adventurous collaborations bring a unique, whole-hearted instrumentation (mandolin, cello, double bass) to Bach, cheerfully reminding us that baroque music is a living tradition. The trio’s adaptations of selections from “The Well-Tempered Clavier” and “Art of the Fugue” are especially fascinating. Each note springs out of the speakers with zest. Superstar tenor Jonas Kaufmann takes on Mahler’s tremendous “Song of the Earth” solo, bucking the composer’s direction of two vocal soloists alternating movements. His rendition is powerful but sensitive, never lost in its own light. Jonathan Nott conducts a pillowy Wiener Philharmoniker. Jennifer Higdon’s lush orchestral works embrace Americana with neither irony nor cheesiness. This is exemplified in the driving fiddling from Roberto Díaz in the Viola Concerto, James Button’s lonesome solos in the Oboe Concerto, and the sweeping vistas of “All Things Majestic,” a symphonic postcard from Grand Teton National Park. A Cuban childhood piano teacher was the catalyst for this formerly embargo-crossing collaboration between the Havana-based orchestra of young virtuosi and music professors and the New York pianist. The vibrancy and energy of the album’s two Mozart piano concertos (Nos. 21 and 23) were achieved despite the recording hours in Havana’s centuries-old Church of Oratorio de San Felipe Neri: 11 p.m. to 3 a.m. to avoid nearby construction and television noise. If you weren’t at Symphony Hall for the BSO’s November 2016 Brahms symphony cycle, which included a singular, poignant performance of the First Symphony on Election Night, this two-CD set on in-house label BSO Classics is the next best thing. Recorded live during performances over two weeks, the depth, warmth, and spirit captured is incredible. BSO artistic partner Thomas Adès conducts the London Symphony Orchestra in three of his own vast orchestral works. This is music of perpetual motion on a cosmic scale, that will seize you, lift you, crush you, and make you feel infinitesimally small. “Tevot” and “Polaris” launch into the stars on searing cold fire. The age of the composer-critic may be largely over (can you say “conflict of interest”?) but their work lives on. Virgil Thomson was known for his idiosyncratic music in the concert hall and sharp pen on the pages of the New York Herald Tribune. There, his stable of stringers included such famous names as John Cage and Lou Harrison, as well as some names due for spotlight time such as Paul Bowles and Peggy Glanville-Hicks. These recordings, from a 1950s Columbia Records series, have been lovingly remastered for this release. A Norwegian ensemble with a history of blending the ancient with the new looks homeward. “Rímur” explores Scandinavian melodies, medieval chant, improvisations, and the Icelandic polyphonic practice known as tvísöngur, or twin-song. The vocalists’ sound is clear and brilliant, and Arve Henriksen’s trumpet acts as a mellifluous fourth voice.